E-book War Rages On, Paper Book Is Loosing It? If you cannot read the message below, please click here. Google, Sony and other international famous brand have already set foot in E-reading, even Ebook entrepreneur in China has predicted that "It will replace traditional book within 10years". Hardware manufacturers, content providers, and even mobile operators are competing to squeeze into this industry. Meanwhile, the birth and expansion of e-book will also bring huge reconstruction of traditional industries, especially traditional publisher, bookstore and distribution system. This shows that "paperless reading" culture is slowly approaching. e-catalogue. In simple term, we must use special reading software (Adobe Reader), in form of digital file type, through internet download to your operating platform, such as: personal computer, Note-book, PDA, WAP phone, or digital reading material. The main file format for ebooks are, PDF, EXE, CHM, UMD, PDG, JAR, PDB, TXT, BRM and so on. Currently, many popular mobile devices provide ebook functionality. Ebook has existed in early stage, but there isn't a mature system to support the current needs, and that is why it hasn't been doing well in the market. In recent years, Amazon.com has published a revolutionary eBook-reading device known as Amazon Kindle, during the time e-book being released, e-book market really exploded. E-book has provided a function eiher with full-text or important keywords search, easily extracting the main contents from the books. E-book can even provide bookmarking and note function, it may also be read according to different platforms, but there are various personal settings, such as : My Favourite, My Library and etc. Digital ebook contents can be digitalize, update and ammended rapidly, which can then be used to provide latest relevent information. You can combine audio, video, multimedia contents within an ebook, reading habits will no longer limited to extract informations on plain piece of paper, instead providing user more sensory experiences, and even entertainment purposes. Ebook is able to convert multiple heavy paper books into digital memory, even hundreds copies of encyclopedia can be converted and carried or even stored for reading whenever required. The main advantages of ebook over paper books, is that it provides massive data storage system and multimedia presentation kit, such as text, picture, video, animation, sound and so on, quick search function, environmental friendly, easy to carry.The downside to use ebook is that, it is expensive, difficult to operate, and user might experience certain technical and copyright issues. Moreover people are used to paper book culture and not use to read book from a digital screen. Looking to future trends in e-book, its development can effectively relieve storage pressure. You can produce as many as you like, without the needs of creating the actual books. You only need to create the product base on clients number of copies. There are signs that the United States, led by Amazon Kindle, a growing number of vendors involved in e-book market and international market research agency, Informa Telecoms & Media (refer as "ITM") release a report, ebook-reading device's sales are expected to reach 14 million units in 2013, while in 2014 they will face other type of consumer electronic products such as iPad and WePad, and its sales are predicted to fall by 7%. Apple is launching iPad on April, Wishful thinking is to obtain certain profit in the billions of dollars each year in the e-book market share. The main function of iPad, is to read ebook contents, which indicates they are competing against the 3 leading ebook manufacturers, including Amazon Kindle, HanWang, Sony and so on. 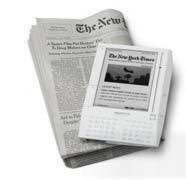 iPad accompanies with LCD display, compared with other ebook reader kit it has certain advantages and disadvatages. Can ebook really be replaced by traditional paper book? Will ebook market being dominated by iPad, led a big bang in the current trend? The future war between iPad and WePad are inevitable, who will emerge victorious in the end? We shall wait and see. Nand Digital Corporation Sdn Bhd is the nation's premier choice for creative development and new media. We consult with each client to discover and highlight and deliver a distinct competitive edge. "Trust" is the foundation of Nand Digital Corp's approach in businesses and it is subsequently the key for its success. Nand Digital Corp. has created a sustainable partnership with its suppliers and clients. Through the company's rigorous quality control and monitored testing environment, Nand Digital Corp can guarantee to supply the highest quality products. Copyright © 2010 Nand Digital Corporation. All rights reserved.